Alabama hospitals and medical centers are taking the initiative to improve health quality compliance in a statewide deployment of Proventix’s RFID-enabled hand hygiene monitoring technology. The Putting Power Into Healthcare Initiative (PPHI) is an employer-funded partnership with Alabama Power, Proventix and participating Alabama hospitals. The initiative focuses on increasing health quality compliance in hospitals and cut down on healthcare-associated infections (HAIs). 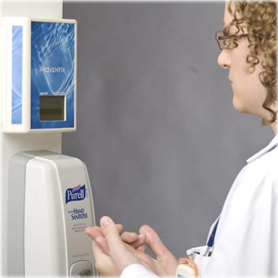 Proventix’s nGage system uses active RFID tied to a data-backed network to encourage and track hand washing across multiple hospitals in the single state, while creating operational efficiencies for the health care workers and systems. Using nGage, hospitals are able to measure when and how often their employees and health care professionals wash their hands. Birmingham’s Princeton Baptist Medical Center conducted a seven-month study to determine whether increased hand washing prompted by the nGage System could reduce infection rates. During the study period, infection rates dropped 22 percent in the unit where the system was installed. That translated into 159 fewer patient days and an estimated health cost savings of more than $133,000, officials say.